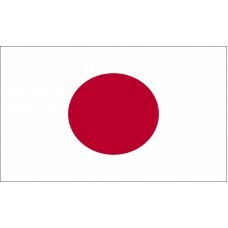 The Japan Flag is comprised of a white rectangle with a red circle in the center. The circle represents the sun, which is important to the Japanese people, while the white background is symbolic of honesty and integrity which are highly valued in Japan. The flag represents the country's cultural history and national value system. It is officially called the Nisshoki, which means "sun mark flag," but is more commonly known throughout the country as Hi no maru, which means "circle of the sun." Japan is known across the world as the "Land of the Rising Sun," as the country lies to the west of the Pacific Ocean and has vast coastlines, which makes it perfectly placed to witness the daily sunrise. The sun has played a huge part in the development of the Japanese people over thousands of years. It is linked directly with original Japanese religion and system of government. For much of its history, Japan felt no need to have a national flag. Its current design was only officially recognized in 1999, when the Law Regarding the National Flag and National Anthem was enacted. The red sun disc design has been a part of Japanese culture for much longer than the country itself has existed. It is intrinsically linked to the Emperor of Japan, a position held today by Akihito. Akihito is the most recent of a line of Emperors of Japan dating back nearly 2,000 years. As such, it is the longest surviving ancestral dynasty in the world. Its founder was Emperor Jimmu, who was himself believed to be descended from the Japanese sun goddess Amaterasu. Amaterasu is a vital part of the Shinto religion. The Japan Flag is a link between the country, its Emperor, and this religion. Shinto is unique to Japan, and is a system of living rather than a belief in any particular God. It gives the Japanese people a way of remaining connected to their past in one of the world's most dynamic economies. Japan is a country of huge contrasts. Its cities are the envy of many countries, but they nestle in a landscape of mountains in a country prone to earthquakes and volcanic eruptions. Shinto means “way of the Gods.” By practicing it, Japanese people carry out daily exercises and rituals which give spiritual meaning to physical things. These can be trees, rivers, or people. 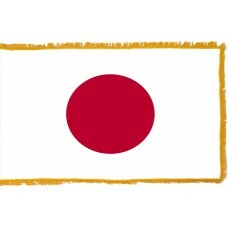 In following Shinto, the Japanese people connect daily to Amaterasu, who is represented by the red disc on their national flag. The people of Japan have a very special relationship with their country in many ways. This is represented by the simplicity of their national flag. Instantly recognizable around the world, the Circle of the Sun is a unique symbol of a unique country.